With the introduction of the new NV200 Compact Cargo Van by Nissan, Adrian Steel has released a full line of cargo management solutions designed specifically for the NV200. These products highlight Adrian Steel's signature high quality, innovative designs in the areas of shelving, trade packages, partitions, and ladder racks. 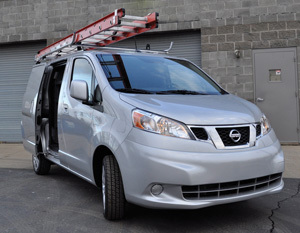 Our line of NV200 Compact Cargo products is now available and features new core products like shelving, trade packages, partitions, and ladder racks. In addition to these new products, Adrian Steel has many existing modular products that will integrate into the new NV200 Compact Cargo van, including drawer units, hook bars, door kits and dividers.